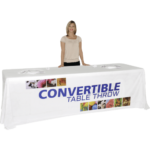 Complete any event or trade show presentation with a high draped, fitted, or stretch, dye-sublimated printed round table throw. 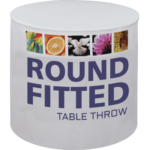 Round table throws are tailored to fit 30″, 48″, 60″, diameter round tables, providing a stylish, customized and branded appearance for use at events, trade shows and in retail environments. 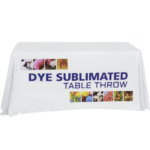 Table throws are printed on washable polyester using dye-sublimation. 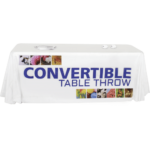 Complete any event or trade show presentation with a high draped, fitted or stretch, dye-sublimated printed round table throw. Round table throws are tailored to fit 30″, 48″ and 60″ diameter round tables, providing a stylish, customized and branded appearance for use at events, trade shows and in retail environments. 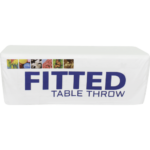 Table throws are printed on washable polyester using dye-sublimation. 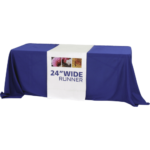 These fitted runners, covers and throws will help you reach a professionally branded look at your organizations next convention or exhibition! Building a brand that people recognize starts here by covering your standard complimentary trade-show table that conventions and expos provide. 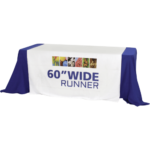 All of our table covers are easily customized with your company’s branding. Simply upload the artwork that you would like to use or allow one of our designers to create the perfect product to suit your needs. These durable and high-quality products guarantee to launch your brand to the next level. Trade shows and conventions are not known to be the most forgiving place for marketing materials such as banner stands, table throws, and table covers. That is why we use premium polyester for its durability and protection from against fraying and tears. If you are not sure how table throws and runners look in the real world, take a look at our idea search and look at some examples! Can I purchase a table runner/throw/cover on the website? Yes! 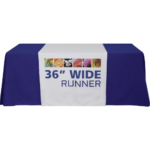 It is as easy as choosing the table cover that fits your needs and adding it to your cart and checking out. During the checkout process, you will be able to upload your company’s graphic into the template provided. Yes! We strategically partnered with Metro Exhibits, a full service trade show provider. From the entire trade show process, Metro Exhibits helps you do it all. From design, to build, to ship, to installation, and dismantle. Metro Exhibits will even ship your booth to any location you desire after the show. Also, Metro Exhibits has the ability to store your trade show display and any trade show materials, such as promotional items, at any of their locations. Should you need your booth or accessories at any time, simply sign in to their portal and order your items to be shipped. It’s that easy. For company’s that participate a lot in conferences, trade shows, expos, and events… Metro Exhibits is the perfect partner for all your event needs. The answer is Yes! Almost every same trade show booth can be rented! It all depends on the availability for your trade show date. However, even if this specific design is not available, a Metro Exhibit representative will work with you in finding a design that matches the exact one you see here. Because of the building materials used, the flexibility of these trade show booths gives your company an advantage on design and price. Use the “Get a free pricing” button on any of these booth pages to speak with someone from Metro Exhibits on the availability of any design here. Yes. Use these designs as almost starting place for your design inspiration. All of our booths have the ability for customization. All graphics seen here can can be fully customized to your brand’s image. If you see a custom booth design idea on our website that you would like to incorporate, save all the ideas to your idea list. Then when you’re ready, you can get free pricing on your entire idea list. It’s that easy. Customizing your trade show expo display has never been simpler! What types of materials do you use in your trade show booths and products? Where do you make your trade show displays and products? You’re at the right place (hence our name). Boothdesignideas.com gives you the ability to become inspired with ideas from the best trade show booths in the nation! Start on our home page and use the search bar to begin your search. For specific products, use our shopping page for purchasing options and ideas. On trade show, conference, expo, or any event idea that you find on our website, our trusted partner Metro Exhibits will always be available to give you convenient pricing options. Should you be interested in the design of certain booth options, feel free to contact them by clicking the “get free pricing on this booth” button on any image page.